Ford Bridgend set for new engine but at a cost? Ford in Bridgend has been recommended to build the company's new generation of petrol engines from 2018, BBC Wales understands. However, the investment would be for an assembly line with the capacity to produce 250,000 engines a year. That is a third of the number of engines produced now. To win the investment there would need to be a change to working conditions to make it more competitive, according to a letter to workers seen by the BBC. A final decision will be made by Ford in Detroit in July. Meanwhile, Ford has announced that it is opening a new plant in India. The Gujarat plant will have an initial annual capacity of 240,000 vehicles and 270,000 engines. Ford's UK headquarters will not confirm that the Bridgend recommendation has been made nor that workers have been given a letter outlining the proposals. Ford Bridgend currently makes 250,000 engines a year for Jaguar Land Rover which will end in 2018. Its also makes 500,000 petrol engines a year for its own cars but production of that generation of engine is expected to come to and end in the next few years. The Welsh government has confirmed that it has been talking to Ford about a £15m financial package to help it attract the investment to build the next generation of engines. The Ford Bridgend plant opened in 1980 and has fought fierce competition to win successive investments in the past worth more than £2.8bn. 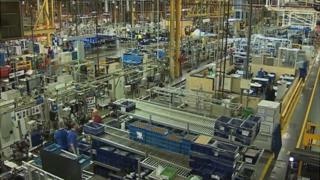 The company says its presence supports around 10,000 jobs in south Wales. It makes petrol engines for Ford, Jaguar Land Rover and up until the end of this month Volvo. Work on the new 1.5-litre EcoBoost petrol engine started last year alongside the larger 1.6-litre version. Back in 2013, the company said it produced 3,400 engines a day or one every 24 seconds off the busiest line. It exports to Spain, Sweden, Germany, Russia, Belgium and the USA. The new Dragon petrol engine from around 2018 will replace what is currently being produced. Bridgend is in effect competing with Ford's other engine plants in Valencia in Spain, Cologne in Germany and Craiova in Romania to make the new design engines.